CityCenterDC is a new 10-acre neighborhood that was built on the old Convention Center site in Downtown Washington, DC. The first phase of the project (opened in late 2013) is pedestrian-friendly with more than 185,000 square feet of retail situated at the base of six buildings that encompass 458 rental apartment units and 216 condominium units; and 520,000 square feet of office space. The project also includes 1,555 below-grade parking spaces; a new street grid reinstated throughout the site, and nearly an acre of public open spaces. What was once the site of D.C.'s former convention center — and after that, a large parking lot — is now a gleaming few blocks of high-end stores, restaurants, condos, and apartments in the heart of the city. The tony 10-acre development began selling residences in 2013, and some of the starriest names in fashion opened shops here along with restaurants from both local and internationally-known chefs. Consider this Washington, DC's version of Rodeo Drive: this mixed-use development is home to luxury stores like Hermès, Dior, Gucci, Louis Vuitton, Moncler, and Burberry. From Salvatore Ferragamo's beloved flats to Paul Stuart suits or Jo Malone perfume, this is where to head in Washington if you want to splurge on something designer. For shopping that's a bit easier on the wallet, there are contemporary brands like Kate Spade, Vince, and Zadig & Voltaire. CityCenterDC is worth visiting even if you're just window shopping: a kinetic art feature with colorful videos and a water feature is stunning, and the seasonal displays hanging from the storefronts are huge hits on Instagram. Big-name chefs opened flagship locations at CityCenterDC, which draws both tourists and locals for dinner. Find David Chang's hip Momofuku (minus the ramen) along with sugary treats to go from Milkbar; Daniel Boulud's lively French bistro DBGB Kitchen & Bar; and Top Chef alums/brothers Bryan and Michael Voltaggio's fancy new restaurant Estuary in the Conrad hotel. National chains are here too, like Mediterranean spot Fig & Olive and expense account-friendly steakhouse Del Frisco's Double Eagle Steak House. But CityCenterDC is also home to shining local stars in the culinary scene. Chef Amy Brandwein's inviting Centrolina restaurant and market serves up incredibly flavorful and creative pasta and mains like wood-fired fish and duck, with a constantly-changing menu. She's about to open another outpost here too with an all-day cafe. Dolcezza is a go-to in town for coffee and delicious gelato, and Virginia's healthful cafe Fruitive is a place for a light meal (as in toast, salad, smoothies, and fruit bowls). Since CityCenterDC is downtown, it's near many eateries, including hot dining neighborhood Penn Quarter and its fast-casual restaurants and hotspots. CityCenterDC is located between New York Avenue and 9th and H and 11th Streets within walking distance to the Washington Convention Center and the Verizon Center. There is an underground parking garage within the development boasting more than 1,500 parking spaces. The garage is open 24 hours a day, and valet parking is available too. Click here to see the hourly rates for the garage. For those who would prefer to not drive downtown, CityCenterDC is located within easy walking distance from the Gallery Place/Chinatown Metro station on the Green and Yellow lines and the Metro Center Station on the Blue, Orange, Silver, and Red lines. The 216 one and two-bedroom condominiums feature light-filled modern interiors with open living rooms and floor-to-ceiling windows, plus balconies and outdoor spaces of up to 900 square feet. Building amenities include a concierge; front desk coverage 24-hours per day; fitness center; yoga studio; bar lounge; two expansive roof parks, as well as a tranquil rooftop water feature; outdoor kitchens and dining room; fire pit; wine storage; indoor dining room; catering kitchen; executive board room; guest suite; landscaped terrace; and a spa treatment room. 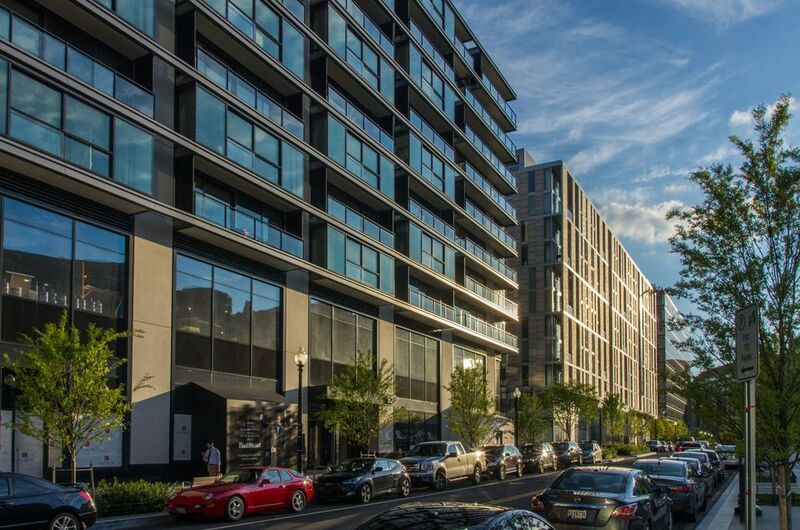 An interactive sales gallery is located at 901 New York Avenue, NW with an impressive scale model of the entire development, a fully built-out model home and a striking view of the new neighborhood under construction. The 458 luxury apartments are designed with functional layouts, including substantial living rooms, open kitchens, and bamboo flooring. Building amenities include an outdoor swimming pool, two-story fitness center, and rooftop dog walk. The development's luxury hotel is the Conrad Washington, DC, the newest property in the Conrad Hotels & Resorts luxury brand portfolio operated by Hilton Worldwide. The project is designed by Herzog & de Meuron Architekten, an internationally acclaimed design firm headquartered in Basel, Switzerland, and HKS Architects, Inc., a Dallas-based design firm with offices worldwide, including the District of Columbia, as Architect of Record. The hotel just opened in March 2019, with sleek decor, stunning views, and a restaurant from celebrity chefs Bryan and Michael Voltaggio.